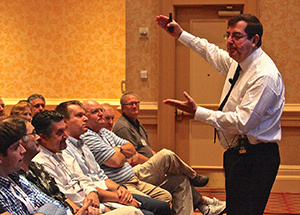 More than 2,300 anti-fraud professionals from around the globe come to Orlando to refresh their mission. "We believe in integrity, we believe in the ACFE. While we're here in this time and space, we'll help make the world a better place." Those words renewed the clarion call of fraud fighters around the world as the ACFE Anthem video debuted in the opening general session of the 23rd Annual ACFE Fraud Conference & Exhibition. More than 2,300 anti-fraud professionals from around the globe gathered June 17-22 in Orlando, Fla., to refresh their mission to battle the ongoing relentless scourge of fraud, gather vital information, reconnect with colleagues and friends, and create new relationships. Attendees heard the harrowing tale of whistleblower Michael Woodford, MBE, the former CEO of Olympus, and the defense of the U.S. Dodd-Frank Act, from one of its authors, U.S. Senator Christopher J. Dodd. 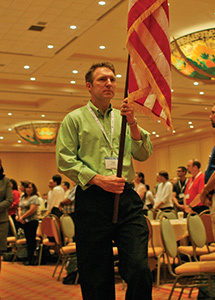 At the beginning of the opening general session, as in years past, members carried 60 flags representing the membership's nationalities to the dais. ACFE President and CEO James D. Ratley, CFE, said the association "remains the largest anti-fraud organization in the world. … The ACFE is a truly global association, with more than 25 percent of our members hailing from countries outside of the United States. "Not only has the attendance at our annual conference continued to grow each year, in 2011 we added over 5,000 professionals to our membership rolls. In the flag procession, the American flag was carried by Mr. Ted Lowery, the 60,000th member of the ACFE. "But we couldn't have the 60,000th member without the first member. 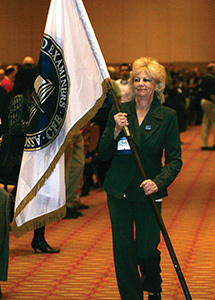 The ACFE flag was carried by Ms. Nancy Bradford, CFE No. 1." Ratley then called Bradford to the stage and presented her with a large framed photo of the official ribbon-cutting ceremony — signed by staff members — of the naming of one of the headquarters' structures as the Bradford Building. "Last year, 35 percent of our new members were from countries outside the United States," Ratley said. "We are increasing our efforts to expand and gain increased recognition of the ACFE globally, which will create more opportunities for fraud examiners everywhere. In October of 2011, we held our first Asia-Pacific conference in Singapore. [It was previously known as the long-running Pacific Rim Fraud Conference.] I was fortunate enough to speak at that event, and while there, I also had the honor of visiting with chapters in Jakarta, Hong Kong, Shanghai and Beijing. We have experienced a steady growth in Japan and Europe as well." Ratley said that the ACFE Corporate Alliance Program, launched during last year's ACFE Annual Fraud Conference, has achieved overwhelming success. "A number of major corporations throughout the world have expressed an interest and are in the process of signing up for the program. Membership in the Corporate Alliance Program denotes a commitment to the fight against fraud and provides your company with exclusive training opportunities as well as savings on ACFE Seminars, self-study courses and on-site training," Ratley said. Dr. Joseph T. Wells, CFE, CPA, founder and Chairman of the ACFE, said during the opening general session that many members have claimed he has the ability to "project future trends in fraud and white-collar crime as if I had some sort of crystal ball. "I foretold years ago, for example, huge corporate frauds that had yet to acquire a name but do now: Enron, WorldCom and others." Dr. Wells said it is a big part of his job to read the handwriting on the wall. Attendees had their pick of diverse anti-fraud topics from the Pre- and Post-Conference and the in-between Main Conference. Four excellent speakers led Pre-Conference sessions. Leah Lane, CFE, global investigations manager for Texas Instruments, spoke on "Conducting Internal Investigations: Planning and Logistics." "Creating an Effective Work Product for the Courtroom" was team-taught by Frank Wisehart, CFE, CPA, ABV, CVA, director of business advisory services for Schneider Downs Inc., and Douglas Squires, J.D., adjunct professor of law, Capital University Law School and federal prosecutor. Ryan Hubbs, CFE, CIA, PHR, CCSA, senior manager of Matson, Driscoll & Damico, forensic accountants, led the Pre-Conference, "Planning and Conducting Vendor Audits." During the Main Conference, attendees learned practical concepts at more than 70 educational sessions in 12 tracks. Tracks ranged from "Technology You Can Use Against Those Who Use Technology" and "Risk Management & Compliance" to "International Anti-Fraud Efforts: The Issues of Borderless Fraud" and "Professional Development." In starting your firm, this article covers some specific aspects of being a new entrepreneur, including the legal forms of business organizations, insurance, tax responsibilities and retirement savings. 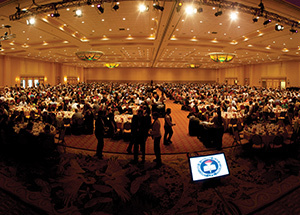 The 20th Annual ACFE Fraud Conference & Exhibition in Las Vegas sets attendee record despite recession. Read highlights from the event.